Marvel has just released a new origin story for their newest symbiote and villain, Knull. Although Knull may have made a cameo back in 2013, none of us had known who he really was. There was no information given out about the particular “dragon” Thor smashed five years ago, but now we have a full backstory as to what this new antagonist’s intentions may be. For anyone who needs a quick recap, symbiotes are parasitic and sentient “living-suits”. Their species is called the Klyntar in the Marvel universe. These “living-suits” bestow supernatural powers and appearances on the wearer or “host”. They are always featured in any and every Venom comic or story arc. 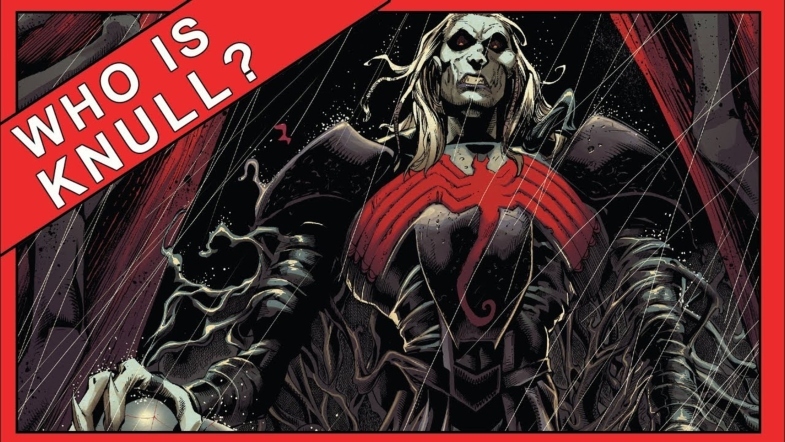 In the latest volumes under the writing of Donny Cates and Ryan Stegman, a new origin has arisen of the origins of the symbiote species in the form of Knull, God of the symbiotes. Knull’s story is unique, dramatic, and a perfect origin for such a dark and savage figure. Knull is estimated to be at least 13.7 billion years old. This places him as one of the oldest characters in Marvel history! He is an ancient, malevolent deity who was created in the black empty space that was the universe. That is, until the Celestials began their campaign of creation. Knull felt insulted and invaded. The Celestials, in their godlike splendor, had begun to brighten up his kingdom of infinite black fathoms. It is at this point, where we learn of Knull’s true power. He is able to pull an evil blade from his mere shadow, and completely decapitate one of the gargantuan Celestials. However, after the death of their comrade, the remaining Celestials cast our new dark lord back into the endless void. But he would not be forgotten that easily. Knull used the decapitated head of the fallen celestial as a forge to sharpen his blade of shadows. He then also created the first symbiotes out of his eldritch darkness to become his armor and protection. When he had failed a second time on his genocide of light, Knull crash landed on a new alien planet. Our villain uses this planet to host his own new symbiotic army. Now, keep in mind, Knull’s creations are all mindless and under his control at this point. He has total power over them, and commands them to take over planets and devour entire civilizations; the symbiotes would bond to any life-forms they found and forcibly control their bodies in any way their master desired. Now, we must come back to his initial first cameo appearance. On Knull’s first attempt at conquering earth, he sends a symbiote-wielding dragon. However, Thor is able to defeat it. This results in dire consequences for Knull. When Thor had defeated the dragon, he had also unwittingly broken Knull’s connection to all of the symbiotes he had created. This results in all of the symbiotes we already know in the Marvel Universe. After finally being free from mindlessness, the millions of other symbiotes scattered throughout the universe would begin to not just bond with their hosts physically, but many would develop values and relationships with their hosts. And because he had enslaved them for almost eternity, the now free symbiotes enacted vengeance. They had all come together to trap Knull in a planet sized mass, containing him within all of their tangled tendrils. This is where we get the name for the symbiotes’ race: Klyntar means cage in their language. This character reveal is huge! Not only does Knull complete the origin of all of our favorite symbioteic characters, but he also is old enough to be considered the universes first greatest fear. He can kill literal gods, shape-shift into any form he desire, and basically control anything with a symbiote. We’re sure to see even more of the Dark God of the Symbiotes in the ongoing, new, Venom series, especially since he has just been awoken.